Creating masks and selections within photos can be tedious and time-consuming, even for professional photographers that edit images every day. 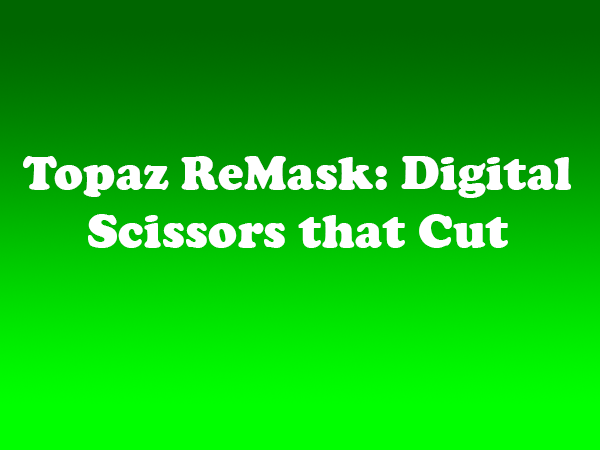 Topaz is taking the pain out of mask making with ReMask, its new plug-in for Photoshop. While there are many editing tools that allow photographers to switch backgrounds, make composites, and selectively adjust images, ReMask is arguably the best. It not only creates a flawless final product, but also is extremely easy to use. In many cases, creating a perfect cut out requires only a few digital brush strokes. To mask an image, the user first outlines the subject that he or she wants to keep in blue, and then fills in the area to cut in red. The software then provides five different previews of the image so the user can determine where any touch ups are needed. After creating the final mask, the user can also erase or replace the background. “Our main focus is to give you the best quality mask from minimal user interaction. Compared with Photoshop, ReMask doesn’t need tedious brush work to get a high quality mask. You only need to roughly outline your subject and press ‘Compute’,” Ben Ma, Topaz Senior Software Designer, stated. It is a royal pain to make a good cut-out in Photoshop and it is very very time consuming. With ReMask, an easy cut-out can be done in a couple of minutes and I’ve never spent more than 15 minutes on a hard one. I photograph mostly wildlife, so importantly for me, it does a better job extracting fur and feathers from the background. ReMask 5 is compatible with both Windows and Mac systems and works as a plug-in or a standalone program. The software retails for $69.99. Topaz also offers a free 30-day trial of a fully functional demo version of the software.